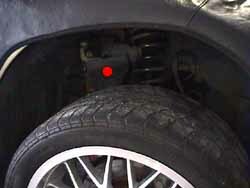 The Z32 came with minimal alignment adjustments. On the front, the only adjustment is the toe-in. 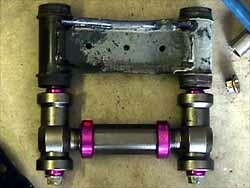 Caster and camber cannot be adjusted without special after market parts. The upper links, commonly called A-arms, control the amount of camber. This is the amount the wheels lean inward (negative) or possibly outward (positive). The more negative camber, the better the car will corner. This comes with the price of more inner edge wear on the tires, as the inside edge takes more travel abuse then the entire tire will take under cornering. If the car is only for racing, then numbers like -2.0 or -2.5 degrees of camber are acceptable. For most people, it's not. The factory spec is -1.35 to -0.05 degrees *unladen*. Laden alignment number should be -.5 to -1.5 degrees, I think this is the best way to measure. I think the alignment specs have changed along the way.. like in '92 according to the Hunter bench I get my alignment done on. I need to verify the real numbers. The alignment specialist will know the answers. 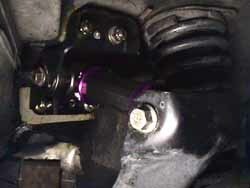 Adjustable upper links are usually required when the car is older and proper alignment specs cannot be met, the car has been in a front end wreck and the frame wasn't straightened properly, or the car has been lowered or the suspension geometry has been altered somehow to effect camber. There are two basic styles of adjustable upper links: The Stillen 'slide plate' design and the Japanese 'turnbuckle' design. I'll cover installation of both, but all illustrations are of the Japanese "Midori" adjustable upper links. This installation is on a '93 TT. 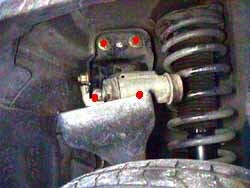 The best time would be when any other suspension work is being done that requires an alignment, or when proper alignment requires it. 1. 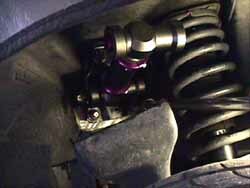 Lift the front end of the car high enough to stretch out the front suspension (1.) and secure with jack stands on the frame rails. Observe all safety precautions. Read the rest of the page and soak all involved bolts and nuts with a penetrating lubricant. I recommend PB Blaster. 2. Remove the bolt connecting the upper link to the third link (red dot in 1.) (1 x 17 mm bolt, 1 x 17 mm nut). The 17 mm nuts holding the arm into the bracket and third member, along with the bracket to the frame are all 'one use' nuts. A slightly misleading term, they can be re-used, but they won't self lock again unless they are re-set by striking the top side of them with a metal hammer. I generally don't bother with this, as the torque specs are high enough to keep things from coming loose on their own. Cleaning the nuts and bolts, then applying Loc-Tite will do the same thing for people wanting to be slightly more cautious. The wheel will sag a bit more when the third link comes loose from the upper link. 3. Lift up the upper link a little and remove the two lower nuts holding the bracket to the frame (lower red dots in 2.) (2 x 14 mm nuts). The 'bolts' are part of a plate assembly in the engine bay, so there is no bolt head to put a wrench on. Make sure to be fully seated on the nuts before trying to remove them, they are easy to round off. A 18" x 1/2" extension covered with a towel or rag to prevent scratching the fender paint on a good sized breaker bar make this easier then trying to twist a wrench inside the wheel well. Remove the upper nuts holding the bracket to the frame. If these nuts have never been removed before, the self locks are binding the bolt properly. Air tools might have some difficulty with this, just use the breaker bar to get them started & the air tool to finish them off. 4. Remove the bracket from the frame. Remove the upper link from the bracket ( 3.) (1 x 17 mm bolt, 1 x 17 mm nut). 5. 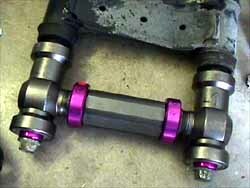 Use the upper link bolts to check the length of the new adjustable upper links against the factory upper links. This gets the length in the ballpark to get the car over to the alignment rack. For the Japanese style links (Midoris): Twist in both ends in until the link is as short as it can get without binding. Keep in mind one end isn't 'righty tighty', but backwards for the link to work properly. Get the link properly situated, as there is a front and back, and left and right, they should be marked as what side and end each are, at least the Midori's are (red dot stickers go toward the engine, longer side goes forward). Keeping the same 'alignment' slowly twist the center section until the link extends to the same length as the factory upper link. Use the bolts to check the length (4. & 5.). Loosen the locking collars (6.) (2 x 5 mm hex) and twist them around to where they will be accessible once mounted back in the car. Loosen the locking nuts (4 x 1/2") and run the ends to the appropriate length using the upper link bolts to check the correct length. Torque the lock nuts to 15 ft-lbs. 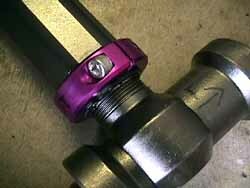 Thoroughly cover the shafts of the link bolts with high temp, non lithium, water resistant chassis/bearing grease. Stillen recommends against white lithium grease, they also recommend relubing ever 10k miles to avoid bushing squeak. 6. Attach adjustable upper link to the bracket using the bolt with the "9B" marking on the head of the bolt (this one is a little thicker than the other one which should be marked "9") and a new nut (7.) (1 x 17 mm bolt, 1 x 17 mm nut). Torque to 65-80 ft-lbs. 7. 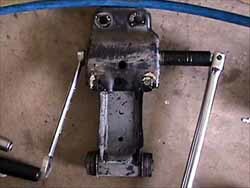 Reattach upper link bracket to inner fender well (8.) (2 x 17 mm, 2 x 14 mm). 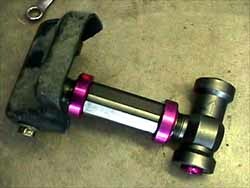 Torque the 14 mm to 43-58 ft lbs. Torque the 17 mm nuts to 80-94 ft-lbs. 8. Attach the other end of the upper link to the third link using the bolt marked "9". (9.) (1 x 17 mm bolt, 1 x 17 mm nut). Torque to 65-80 ft-lbs. 9. On the Japanese style: Tighten the locking collars to 14-21 ft-lbs (2 x 5 mm hex). On Stillen style: Use the grease fittings to push more white lithium grease into the ends of the links to keep them very well lubricated. The Japanese "Midoris" have bearings in the ends and don't need grease. 10. Lower the car, get an alignment done ASAP.